Dr. Yashima White AziLove is the founder of YWA Enterprises where she equips entrepreneurs and influential people to transform their businesses, organizations and personal lives using the power of Elevated Communication and Branding. 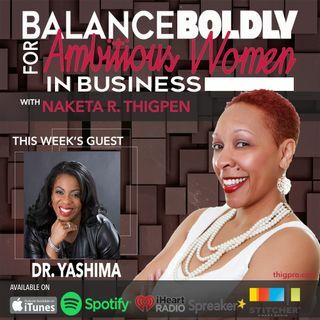 Aside from working with Fortune 100 companies around the globe, Dr. Yashima has been a key player in the marketing industry - ever since she started blazing trails at age 35 when she built her $1 Million personal and professional development agency. As a ... See More provocative speaker, Dr. Yashima finds herself on stage with celebrities and other cultural influencers as she shares her gift of being a fantastic storyteller to the marketplace. ●It’s about permission, calendarizing, and being intentional about the time you spend with yourself.